The color of upper wings bright orange, with yellow appearance. The wings are featured with a fair number of black spots and streaks. They have two antennas on the head. The color of pupa is green or yellowish green. The length of pupa is between 14 to 18 mm. The pupa suspends itself from the silk pad with no supporting silk girdle. 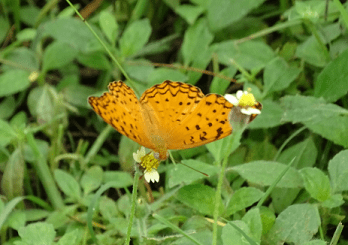 Phalanta phalantha is a Sun loving butterfly and avoids shade. It has sharp flight movements. Visits flowers regularly especially Lantana, Duranta, Meyenia laxiflora, Gymnosporia montana, and thistles. Adults are known to feed from a variety of flowering plants as well as fermenting fruits. The larvae feed on several plants like Aberia, Dovyalis, Flacourtia, Oncoba, Scolopia, Trimeria and Xylosma. Ixora , Gymnosporia, Maytenus, Petalostigma, Smilax, Viola etc……….. The color of antennas is brownish black. They prefer open forest, evergreen forest, Moist Deciduous forest and woodland habitats. Eggs are pale yellow in color, and globular in shape but with a blunt top. Eggs are laid singly on the young shoots of the host plants. 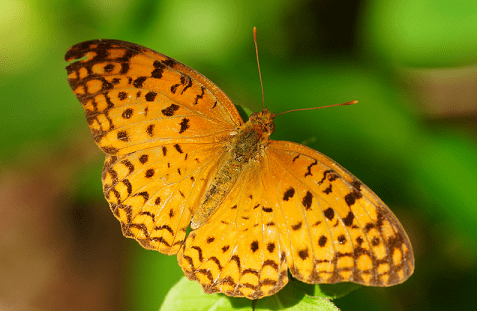 Phalanta phalantha is a beautiful orangish yellow butterfly. They have a wingspan of 50 to 60 mm. The color of upper wings bright orange, with yellow appearance. The wings are featured with a fair number of black spots and streaks. Each fore-wing has two brownish black lines and another at apex of cell a number of discal spots, a postdiscal series of lunules, a sub terminal fine line and a terminal series of spots at the apices of the veins. 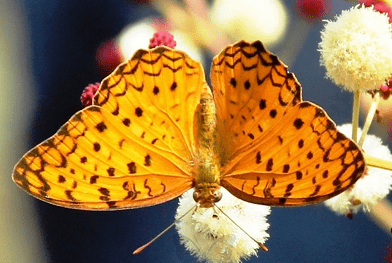 The underside of the butterfly is more glossy than the upper and both the male and female are similar looking. 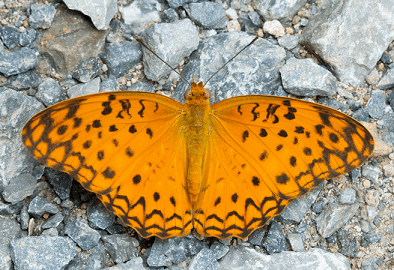 The underwings are paler orange in color, with only a handful of black spots and streaks. A more prominent purple gloss on the underside is found in the dry season. They have two antennas on the head. The color of antennas is brownish black. The color of pupa is green or yellowish green. The length of pupa is between 14 to 18 mm. The pupa suspends itself from the silk pad with no supporting silk girdle. Phalanta phalantha found in India, Bangladesh, Sri Lanka, Burma, China, Japan and south to the Philippines, most of the south-east Asian islands, and northern Australia. 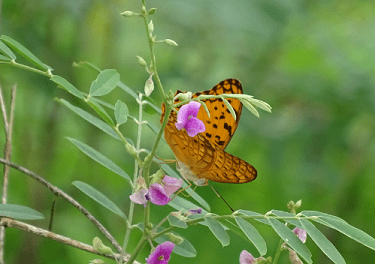 Common Leopard butterflies also occurs across sub-Saharan Africa from Gambia to Ethiopia, and south to South Africa and Madagascar. They prefer open forest, evergreen forest, Moist Deciduous forest and woodland habitats. They also found in tropical and subtropical rainforest, grasslands, city parks, gardens, plains, edges of clearings and near human habitats. It can be found at altitudes from sea level to at least 1000m. It often perches on edges of clearing with wings half open and has the habit of chasing away other butterflies and guarding its territory. They are usually seen alone or in small groups. Males sometimes imbibe moisture from damp sand along riverbanks, but are more strongly attracted to patches of urine, and to dung. 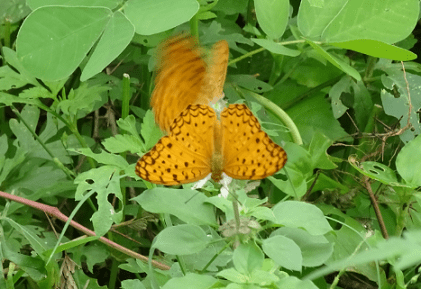 Phalanta phalantha is a Sun loving butterfly and avoids shade. It has sharp flight movements. Visits flowers regularly especially Lantana, Duranta, Meyenia laxiflora, Gymnosporia montana, and thistles. Adults are known to feed from a variety of flowering plants as well as fermenting fruits. The larvae feed on several plants like Aberia, Dovyalis, Flacourtia, Oncoba, Scolopia, Trimeria and Xylosma. Ixora , Gymnosporia, Maytenus, Petalostigma, Smilax, Viola etc. the larvae are known to feed from a diverse group of plants. Some of the plant genera they are known to feed on include Flacouria, Salix, Dovyalis, Populous, and Trimera. The caterpillars feed on young leaves of Rukam Asam and Weeping Willow. Territorial males patrol their range looking for receptive females. After mating, the female hunts for host plants to lay her eggs on. Eggs are pale yellow in color, and globular in shape but with a blunt top. Eggs are laid singly on the young shoots of the host plants. After hatching, the larvae feed on the host plant until they are ready to pupate.